It’s not it too often I pull off a double workout day, especially if I didn’t plan it or do it during training for a race. However, I managed to do so yesterday. At lunch time, I quickly ran over to the yoga studio thinking I’d was late as a meeting I had went a little longer than expected. I was right on time, phew! There were only three of us in the class which was fun. As I went through the warm up, I started to forget everything from the morning and I quickly settled into the class. I was feeling stiff from sitting most of Monday in a meeting and traveling to and from the city. If felt good to stretch so I’d hold the pose just a little longer than normal. Towards the end of the class I noticed my left big toe looked dirty…kinda odd I thought. So I looked at my right toe and wondered why it was so clean looking. Did I wear dirty flip flops recently and my toe strap was dirty? Nope, I’m all about warm socks these days (and clean feet). So, I poked it and it hurt. It was a bruise. A bruise from last week’s soccer game when someone stepped on my foot by accident. Apparently, I forgot all about it but it didn’t bother me until I saw it. I got through the rest of my yoga class and an afternoon at work. Then I picked up the girls, got home and made dinner. I wanted to run, but I had already worked out. Should I run or just relax? And by relax I mean do house chores. After doing dishes, getting the girls to bed and starting some laundry, I jumped on my treadmill at 8:10 PM. 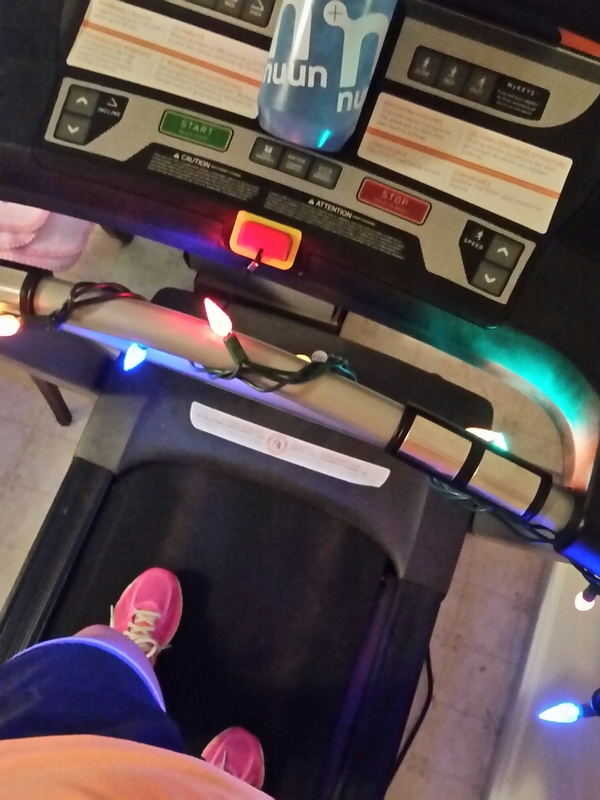 I was motivated to decorate my treadmill with some Christmas lights from @mittenrunner on Instagram. My girls are going to laugh at the lights tomorrow and I’m sure my husband is just going to shake his head at me. Either way it was a fun way to run. I managed to get in a 5k but happy to have accomplished that distance. I’m slow getting in some running this month mainly due to the busy weekend and being lazy Monday night. However, I managed an unplanned double workout day. I am taking that as a win! Do you do double workout days often? Ever forget about a minor injury like a painful? Decorate your treadmill or not? I always have bruises that I have no clue where they came from! I blame in on the kids sometimes 😉 Hope you get out for a run in the next few days. We’ll have to plan for next week. Every Thursday is a double workout day for me. It’s my day off, and I go to see Becky. But I also get in a run in the morning. I have 2 long work days when I can’t do much else, and so those double days are out of necessity. I do some doubles in the summertime when tri training it’s great once in a while. Decorating your treadmill love it! Thanks! The lights made my run that much better! I always feel so accomplished when I’m able to find the time to get in two workouts in a day. As a teacher, I usually have more time over the summer to make that happen than during the school year. This isn’t a common practice for me either. However, if I get to yoga on Tuesdays and then have the motivation to run that evening, I’m not going to stop myself. It took me a while to remember why I had a bruise in between my toes. Good old soccer! I love your decorated treadmill-what a fun idea!! And I also do a double workout day during marathon and ultra training cycles-really helps me get some extra miles on tired legs! That’s kinda how I felt last night – running on tired legs but I wanted to run so I pushed myself a little more….something I haven’t done in a while. Oh my, that would give you lots of bruises I’m sure! 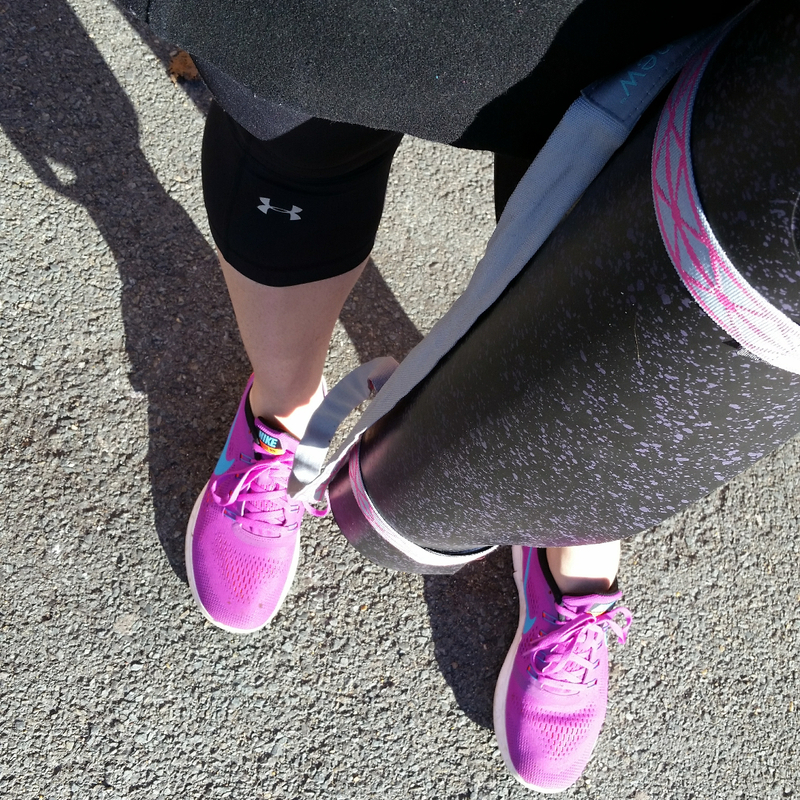 I’m sort of getting in double workouts in December….I’m doing 20-minutes of cardio everyday (usually speed walking outside) in addition to my streaking runs and some strength-training on different days. My treadmill gets little to ZERO action, so no fancy Christmas lights for it. Sometimes the treadmill is the only way I get in my run. Fancy lights are making it that much better! sometimes I do double runs on Tuesday b/c two run clubs have runs–one in the morning and one in the evening–and I like going to both. When I’m not training I’ll do it but when I am, I try to stick to my schedule. It’s good to see you back out though! Yay!! Great job, I occasionally manage a double workout day and it usually feels great! Definitely a win! I need to start running more starting this week as well. I got into NYC Half so need to get my focus back. Do you regularly run outdoors in the winter? Or more treadmill?